And another Micro USB connecting devices. Extra Durability - The stainless steel connector heads slot in easily and steadily, and won't get loose or fall out of your devices as your normal micro cables. This nylon fabric braided jacket is smooth, flexible tangle free, which makes your life more convenient. High Quality: Micro usb cable's copper core is 20% thicker than average, 5000+ bend lifespan up to 4X longer than average, and strict quality control ensures that the product is durable. 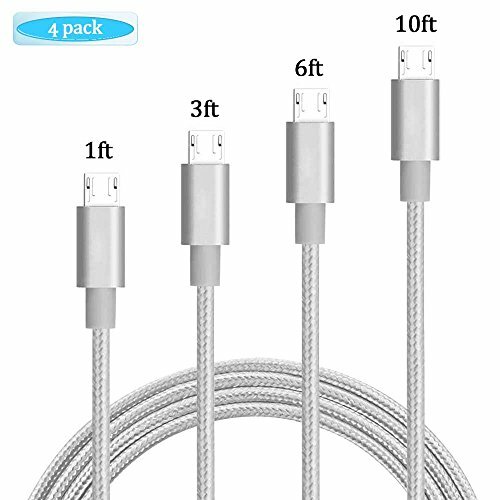 Standard Length: The cable is convenient to use while in bed, a car, or office. No worry again for the different length of cables, make your life more convenient. Warranty Policy: Every sale includes an 12-month, worry-free guarantee to prove the importance we set on quality. If you have any quetions, don't hesitate to contact us! If you have any questions about this product by DECVO, contact us by completing and submitting the form below. If you are looking for a specif part number, please include it with your message.